Borrowed from Portuguese cobra, from Latin colubra (“snake”). Any of various venomous snakes of the family Elapidae. 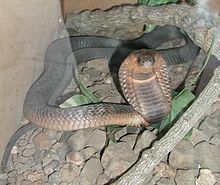 Cobra ( pronunciation (help·info)) is a venomous snake belonging to the family Elapidae. However, not all snakes commonly referred to as cobras are of the same genus, or even of the same family. The name is short for cobra de capelo or cobra-de-capelo, which is Portuguese for "snake with hood", or "hood-snake". When disturbed, most of these snakes can rear up and spread their neck (or hood) in a characteristic threat display.